Your diabetics will be more easily managed with fewer medicines and lower doses of diabetic medicines. Your patients with obesity-associated conditions will enjoy improvements. We will assume only long-term management of patients’ weight while you remain their physician for all other medical problems. We will keep you informed of your patients progress with periodic reports. Did You Know You Can Manage, and Often Reverse, Your Diabetes Through Weight Loss? Not many people know about this and it’s time they do! Through effective weight loss, many of our patients are able to manage diabetes, get off medications, and live a healthier life. Our three-phase, medically supervised program can help you too through safe and reliable medical care. Our Experience Demonstrates Diabetics Benefit from Our Low Carbohydrate Program! A restricted carbohydrate (very low carb) diet in overweight diabetics will induce reduction of fat mass, weight loss, and lower blood sugars resulting in decreased need for diabetic medications. Obesity associated conditions (Asthma, Sleep apnea, arthritis pain, etc.) once insulin was introduced. References: Bray. Obesity 2013; 21:897; Hamman. Diabetes Care 2006; 29:2102. In October 2010, Piper made a decision. Tired of taking medication for her diabetes, hypertension, and elevated cholesterol, she knew that if she lost weight, these conditions would improve and she would feel better. She called us for help. 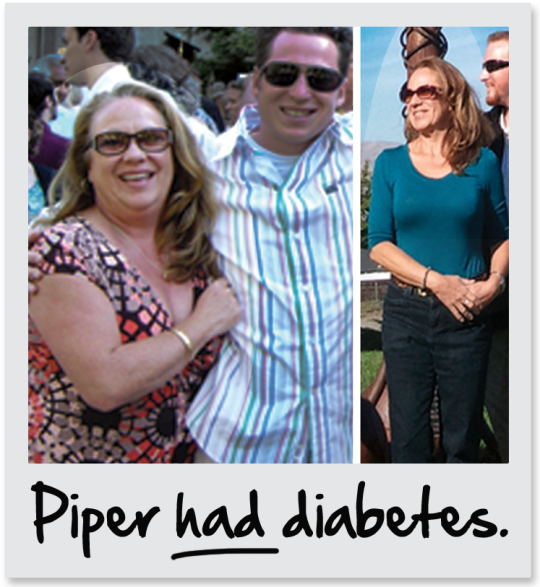 Within 6 months, Piper dropped 50 pounds, reversed her Type 2 Diabetes, hypertension and elevated cholesterol, and no longer needs medications. She reduced her body fat to normal, uncovering her smaller person and restoring her self-confidence. Piper finally learned how to lose the weight and maintain it successfully. Today, Piper is enjoying life and bike riding with her husband again. 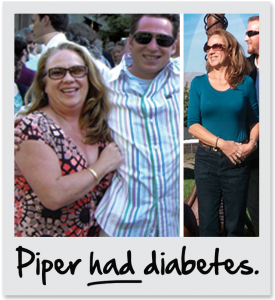 Eliminating diabetes was her ultimate goal but she received so much more by using our proven methods for life-long success. * Individual success varies depending on factors including age, weight, and length of diagnosis. Let us be your extended team to help steer your patients back to a healthy life! Contact us today and we will send over some brochures for you to share with your patients.